We’ve got our Into the Woods Summer Mini Sessions coming up, and here’s a little sneak preview of what we will have set up! We had little Case and his mom over for a fun “camping” trip last week. And back to the blog title... kids will do anything for marshmallows...or at least they will look cute while eating them! Case couldn’t get enough of them, and we were pleased to capture that little happy camper. Our mini session setup is complete with a tribal teepee, lantern, flashlight camping chair, log for sitting, logs set up for a “fire”, and an ice chest with surprise s’mores ingredients inside. It didn’t take long for Case to find the marshmallows, but he had no interest in the graham crackers (that’s okay, more for me haha). 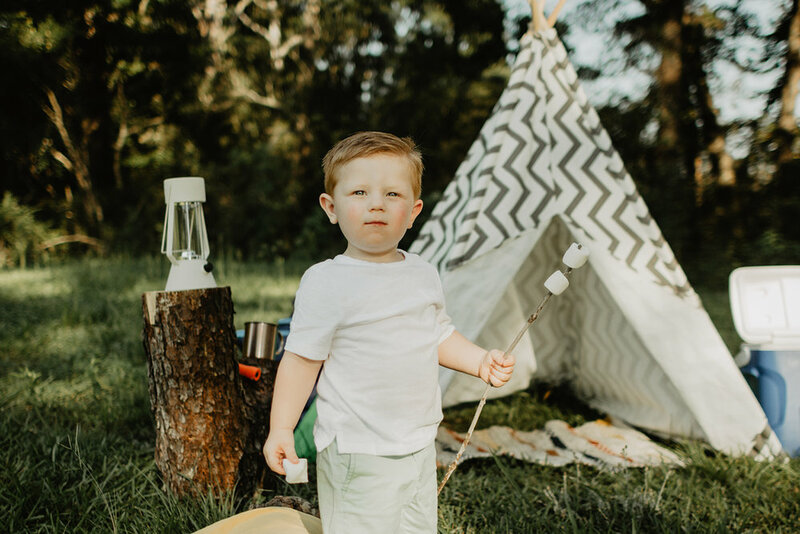 In this mini session we caught him “setting up” his camping gear, getting ready to roast marshmallows, relaxing in his chair, and exploring his teepee. He kept trying to go under the back of the teepee and one time he even knocked it down, which was pretty entertaining ! If you’re interested in booking an Into The Woods Summer Mini Session, we will be shooting these on June 24th and July 1st in Loranger, LA. There’s 5 spots available for each date, so book before they fill up!